The Marshall Mathers LP 2 Review : Are Eminem’s Newest Songs More Creative Than His New Album Title? There used to be a time when the best joke in junior high was coined by Chris Rock who said “You know the world is crazy when the best rapper is a white guy, and the best golfer is a black guy.” Of course, Rock was referencing Marshall Mathers, the controversial rapper from Detroit also known as Eminem, and his demonic alter ego Slim Shady, who together formed 1/6 of rap group D12. Throughout the late 90s and early 2000s, Mathers shredded the mic and was on top of the world (being the best selling artist of the decade between 2000 and 2010), all the while creating a stir with his insane lyrics that he spit with an unmatched natural talent. He reached his peak in 2002 with one of the greatest rap albums in history, The Eminem Show, along with releasing his most popular song to date in “Lose Yourself”. Since then, he’s battled pill addictions, family problems, fame problems, and the death of close friend and fellow D12 member Proof. After realizing the effect his Slim Shady persona had on his personality, he ditched the other half after the comeback album Relapse, and focused on aspects of his rapping that didn’t include previously common themes such as graphic murder, feuds with other rappers, and diss tracks aimed at “haters”. The album to follow was labeled as Recovery and was very commercially successful, sporting themes of redemption and resurgence, spawning hits such as “Not Afraid”, “No Love”, and “Love the Way You Lie”. The only question is, where would Em go next? He took the rap world by storm after being introduced by Dr. Dre, created a whirlwind of controversy for a handful of years, quietly went away, came back, went away again, and came back better than ever with his previous two albums, Recovery, and the collaboration with Royce da 5’9″ (the other half of “Bad Meets Evil”), Hell : The Sequel. Now though, he’s 40, still doesn’t give a damn about a Grammy (even though he has 13), and is over battling addictions and family problems. That means, even though he has a lack of current event material to write about, Marshall would have to tap into his creative side to come up with content for The Marshall Mathers LP 2. Which, if you have ever seen him freestyle, means he is still completely comfortably at home. He reasserts his dominance over other rappers lyrical and natural rapping ability in “Rap God”, at one stretch he raps at a speed of 6.5 words per second. In “Headlights” which features fun.’s Nate Ruess, he finally forgives his mentally ill, alcoholic mother who he previously berated in his career with “My Mom”, and “Cleanin’ Out My Closet”. Eminem also brings up past events with “Stronger Than I Was”, lamenting his broken, twice divorced relationship with ex-wife Kim Scott. The best personal history track is doubtlessly “The Monster”, which features Rihanna, with its only weakness lying in the fact that it too closely resembles Recovery‘s “Love the Way You Lie”. Digging up the past is not where we find the strong points on MMLP2, however. Instead, we find the best tracks stemming from Mathers’ ability to assemble creative lyrics out of seemingly nowhere. Lead single “Berzerk” is rather quirky, sampling both The Beastie Boys and Billy Squier at different points, produced in a style that is reminiscent of “The Real Slim Shady”. There are a few parts that are just a little too strangely mixed for me however, as I feel like the strength in this song lies solely in its chorus. This collection hits its stride with “Survival”, “Rap God”, and “So Far…”, the lattermost sampling Joe Walsh’s “Life’s Been Good”. “Rap God” is simply a lyrical onslaught, with “Survival” sporting a hard beat and explosive distortion, in Em’s fast rapping style in a very reminder of “Till I Collapse”. So overall, what’s the verdict on the LP? There are places where Eminem has matured as a rapper, and he will straight up tell you about it. And really, that’s the only place where this album suffers. There is not a bad track on this record, I just simply do not terribly care about the past traumas that we’ve heard Marshall rap about before. And with a lack of current drama in his life, his hilariously lyriced tracks (“Without Me”, “Superman”, “We Made You”) are thrown out with his Slim Shady persona. If I want to listen to Eminem rap currently, I want a meaningful track such as “Stan”, or “Beautiful”, or an adrenaline filled diatrabe such as “Till I Collapse” or “Won’t Back Down”. Which, he does deliver, practically in spades. “The Monster” is his best meaningful track, and it’s very interesting to see the contrast of “Cleanin’ Out My Closet” and “Headlights”. 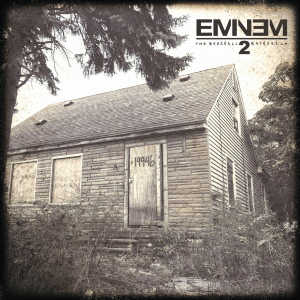 “Rap God”, and “Survival”, along with sections of “Berzerk” showcase Em’s ability to write and rap lyrics like no other. This is a little gem of pop-rock perfectly completed with watery basslines flying all over the place. Extremely well produced and poignant R&B. What’s not to like? Mikky Ekko is very close to breaking out into the mainstream. This is his first big single, but you might recognize him from the song, “Stay”, which he wrote for Rihanna. Justin Vernon (from Bon Iver) is involved. So, its good. Production straight out of the 22nd century, and a weirdly interesting video. Neo R&B at its finest. A great, energetic synth rock ballad. Obviously, “Get Lucky” gets all the attention from their newest album, but “Instant Crush” is a great track as well, though less dance-y. A very pleasant 3 and a half minutes, that seems to stick in my head all the time. One of my favorite electronic music songs of recent memory.